The criticism comes just 100 days before a consequential midterm election. Top officials for the influential Koch political network, which has pledged to spend as much as $400 million this midterm cycle, decried the Trump administration's approach on trade policy this weekend at a biannual meeting of donors in Colorado Springs. "The divisiveness of this White House is causing long-term damage. When in order to win on an issue somebody has to lose, it makes it very difficult to unite people," Brian Hooks, a top Koch official, told reporters at a briefing Saturday. (Evan Vucci/AP) President Donald Trump speaks about the economy at the White House in Washington, D.C., July 27, 2018. 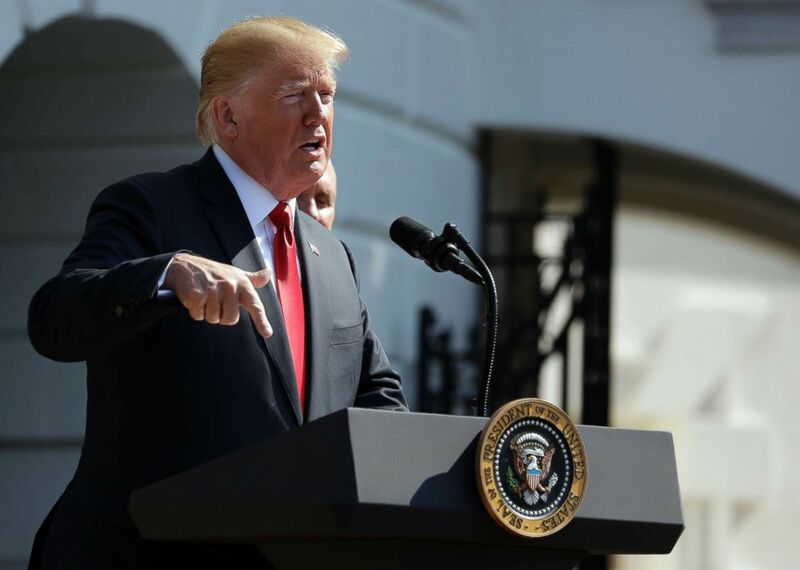 Another official for the network said the Trump administration's plan to spend $12 billion on aid to farmers adversely affected by its hard-line trade and tariff policies is a bailout resulting from "bad policy." "It’s a bail-out to bad policy. You can’t make this up," said Koch network spokesman James Davis, "We put tariffs supposedly to put pressure on China and then it actually hurts farmers here. Crops waste away in the field. Then you pull a Depression-era program out to bail out farmers and make them whole. But who’s underwriting our debt?" In a question and answer session with reporters on Sunday, Koch said the administration's trade policies are "unfair" and the conversation they are triggering is "ridiculous." "This is ridiculous, we should just get rid of all barriers except on things that will hurt people," Koch said. "Yeah, it's unfair. It's unfair to their people," Koch said of countries adversely affected by the Trump administration's trade policies, adding that he has "no idea" if they will trigger a recession in the U.S. economy. "It depends on the degree," he added. "Yeah, if it’s severe enough, it could." 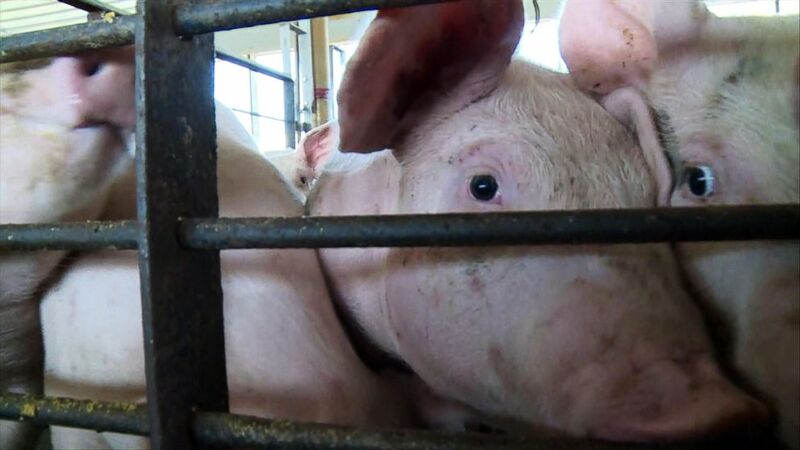 (Alex Mallin/ABC News) Iowa pig farmers say they are losing $25 to $30 per pig because of plunging prices resulting from a trade war initiated by President Trump. On Sunday, the Koch-backed group Freedom Partners launched a new ad blasting Trump's tariff policy as a " tax on hardworking Americans." In the rare session with reporters on Sunday, Koch was also asked if President Trump bears any personal responsibility for the "divisiveness" in American politics. "I think we all do," he said, "We've had divisiveness long before Trump became President...I'm into hating the sin, not the sinner." When asked if he would be ok with Democrats re-taking the House in 2018, Koch was non-committal, but said, "I don't care what initials are in front of or after somebody's name." The Koch network also released a video Sunday attacking the rise of "protectionism" in America, another implicit swipe at the governing style and policy priorities of President Trump. In the video, Koch assails protectionism as the result of people trying to "close themselves off from change," while images of the Berlin Wall, North Korean leader Kim Jong Un, and failed businesses like Blockbuster and Circuit City flash across the screen. "Protectionism is perverting the key institutions of our society," Koch declares. "It’s created immense barriers that are holding people back. So if we want to help all people realize their potential, we have to break these barriers." He told donors gathered at a welcome reception on Saturday evening that the influential network of conservative donors is "just getting started," and focused on "uniting people that are divided." Koch, 82, assured the crowd that despite his age he is "not getting weak at the knees." The re-branding effort comes as the Koch network still continues to wield considerable influence in conservative politics, and remains a major force on the policy trajectory of the Republican Party on not just trade, but other hot-button issues like health care, education, tax policy, immigration and government regulation. "When this network steps out and leads it accomplishes what others said was impossible," Hooks told donors at a plenary session Sunday morning. (Wilfredo Lee/AP, FILE) Florida Gov. 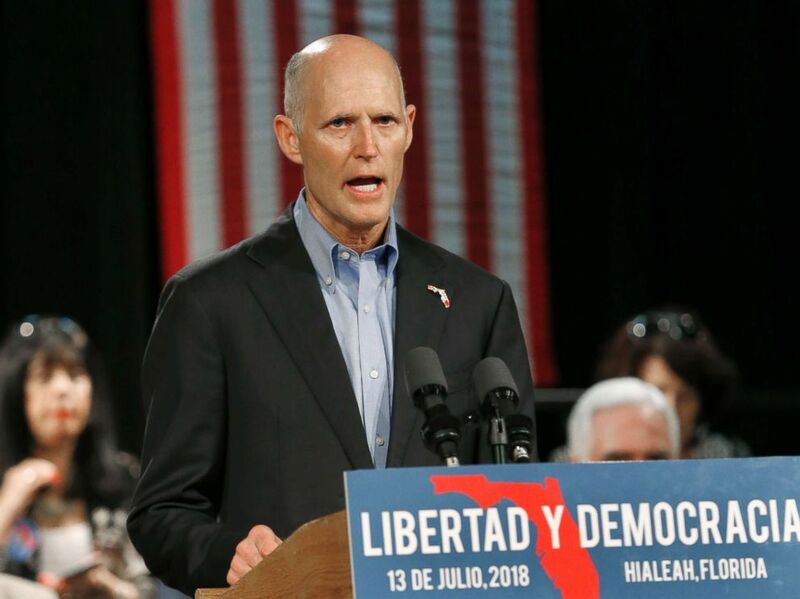 Rick Scott, speaks to Cuban-American supporters at a campaign stop, in Hialeah, Fla., July 13, 2018. White House Deputy Press Secretary Lindsay Walters said President Trump was a "free trader." "He believes that the best way forward is for all countries to get rid of unfair practices and move toward zero tariffs, zero non-tariff barriers, and zero subsidies," she said in a statement. The years' meeting, the largest ever for the network, is being attended by an estimated 500 donors who are expected to give at least $100,000 to receive an invitation. It drew the likes of high-profile Republicans like Senate Majority Whip John Cornyn, South Carolina Sen. Tim Scott, as well as Florida Governor Rick Scott and Tennessee Rep. Marsha Blackburn, who are both running for U.S. Senate seats this year. Just 100 days out from a midterm election cycle where Republican control of the House and Senate hangs in the balance, the Koch network says that while their spending plans have not changed, their strategy will depend on the "opportunities" they see to boost candidates who support broad-based solutions on issues like trade and immigration. Officials also vented frustration at Republicans who voted for a $1.3 trillion spending bill, calling it "crazy." However, top officials for the group would not commit to saying they would oppose Republican candidates for office who embraced what they see as harmful policies; they also didn't say they would support Democratic candidates who aligned with them in certain policy areas. "We’ll work with anyone to do right, and no one to do wrong," said Davis, paraphrasing the abolitionist Frederick Douglass. The Koch network, which is aiming to shed itself of the sometimes politically toxic "Koch Brothers" label, is embracing a targeted policy agenda focused on issues where they see opportunities for bipartisan coalitions to win out over partisan tribalism. 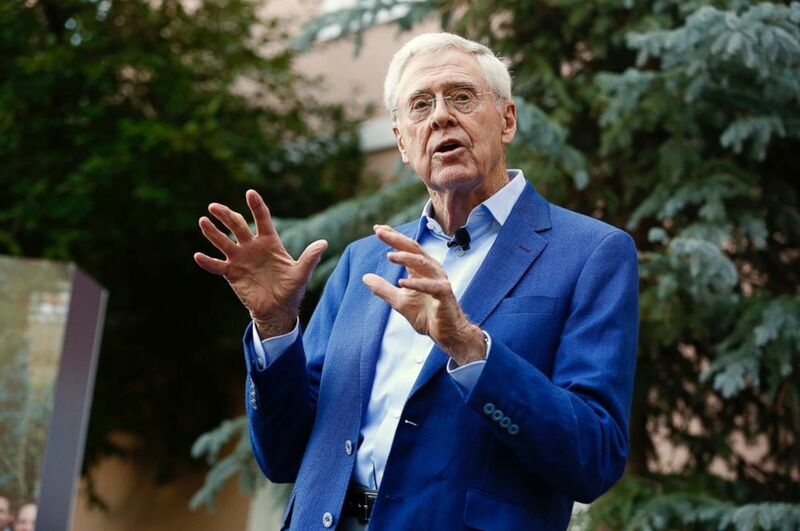 (The Seminar Network) Charles Koch delivers remarks at a biannual donor meeting of the Koch network at the Broadmoor resort in Colorado Springs, Colo., July 28, 2018. One such area is criminal justice reform, where the network is pushing for the FIRST STEP Act, authored by Georgia Republican Rep. Doug Collins and New York Democratic Rep. Hakeem Jeffries. The bill passed the House on a sweeping, bipartisan vote of 360-59, but faces an uphill battle in the Senate, where it is currently opposed by prominent Democrats believed to be eyeing a 2020 presidential bid, including California Sen. Kamala Harris and New Jersey Sen. Cory Booker. Collins and the Koch network believe that opposition will fade if the bill is put on the floor, something they acknowledge is difficult for a Senate that will likely be gripped this fall by a contentious Supreme Court confirmation battle. 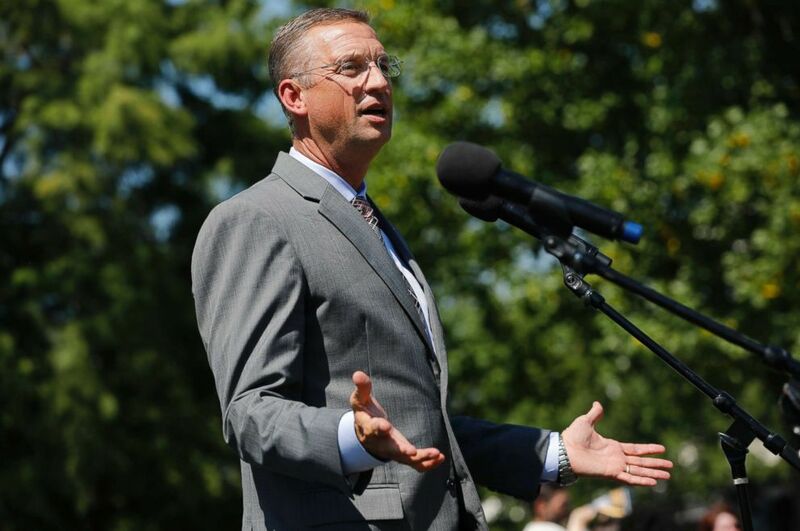 (Aaron P. Bernstein/Getty Images) Rep. Doug Collins speaks during a rally calling for criminal justice reform outside the U.S. Capitol on July 10, 2018 in Washington, D.C.
"I think the American people actually reward getting this done," Collins said, "And if you have higher office aspirations -— then help somebody, don’t hold up something which would help many of your communities." "We should be able to get this done, we are very close," Sen. Scott told donors Sunday. Officials at the meeting also sought to bring attention to the array of philanthropic work funded by Koch-affiliated organizations. One project funded by Stand Together, a philanthropic arm of the network that provides funding and management advice to 86 non-profits across the country, is the Dallas-based restaurant Cafe Momentum. The project offers internships to at-risk youth who have spent time in juvenile facilities, providing them with in-depth culinary training and constant mentoring. "There's a chance to be an advocate for these kids that have so often been labeled as 'throwaways' by society," Chad Houser, the founder, CEO and executive chef at Cafe Momentum told ABC News. ABC News' Meridith McGraw contributed to this report.